Two weeks later and this is no longer a wrist problem, but my whole right arm and shoulder. The dictated reviews shall continue on. There are times where I really fancy a good bit of swashbuckling to cheer me up in the morning (something is sorely needed today with my wrist tendons feeling hard like stone). My prescription: good bit of Errol Flynn. This would be my second Errol Flynn picture, the other being the more critically beloved The Adventures of Robin Hood. Both films also have Olivia De Havilland as his costar/love interest. 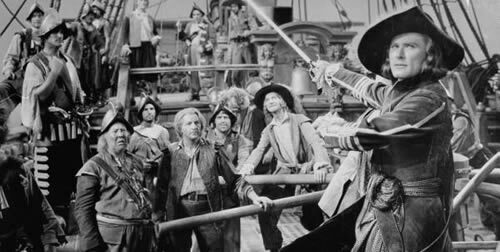 I do not know if it is because I naturally am quite contrary, but I definitely preferred Captain Blood over The Adventures of Robin Hood. Captain Blood tells the story of Peter Blood, an Irish doctor sold into slavery by a King James II for treating the wounds of an English rebel. After suffering the indignity the slavery his luck turns when the Spanish invade the Caribbean Island he’s being held captive on. With his fellow slaves they capture a ship of their own and set sail for freedom and a life of piracy. Obviously this is not real piracy, but cinematic piracy. There is no mutiny on any horizons in fact they get along like a house on fire. Thing is this is a 1930s swashbuckling adventure film so historical accuracy is not high on the menu. This film never seeks to be anything other than entertainment so that’s absolutely fine. It does the job it sets out to do. And finally, although this does not have any bearing on how much I enjoyed the film, I do not think that either Errol Flynn or Olivia De Havilland have looked any better than in this film. Journalistic investigations have provided the backdrop of many great films. This is the first one that I have seen where the focus of the depicted investigation is entirely fictitious. That does not however prevent Man of Marble from being one of the most thought provoking films I have ever seen. I say that the investigation is into someone fictitious, but these people existed in some form it is just that the name is not a real person. And so we delve deep into the rabbit hole of Stakhanovite symbolism (Stakhanov being an exemplar of the overachieving worker). The titular man of marble is Mateusz Birkut, a bricklayer who was chosen to be the poster boy for hard work and efficiency – a so called “lead worker”. At the head of investigation is Agnieszka (played with a fantastic tenacity by Krystyna Janda), a film student whose thesis is about the former lead worker Mateusz Birkut. Going into the film all that is known about him is what can be found in propaganda films, newsreels and previously unaired footage. Pretty early on it is clear that there is intrigued when Agnieszka comes across a toppled marble sculpture of Birkut lying in a museum basement. The entire film is told through a series of interviews, flashbacks, well edited newsreels /propaganda films and meetings in the projection room. Also you have to pay tribute to the interesting soundtrack where both contemporary music and Stalinist music go hand in hand. The big thing that needs to be noted is that this film was released in early 1977. As a country it was still behind the Iron Curtain. Censorship is still rife and yet film denouncing the government so vehemently manages to slip through the net. Sure, there are some details of the film and that did not make it past censors that these are negligible things that got cleared up in the follow-up movie Man of Marble. 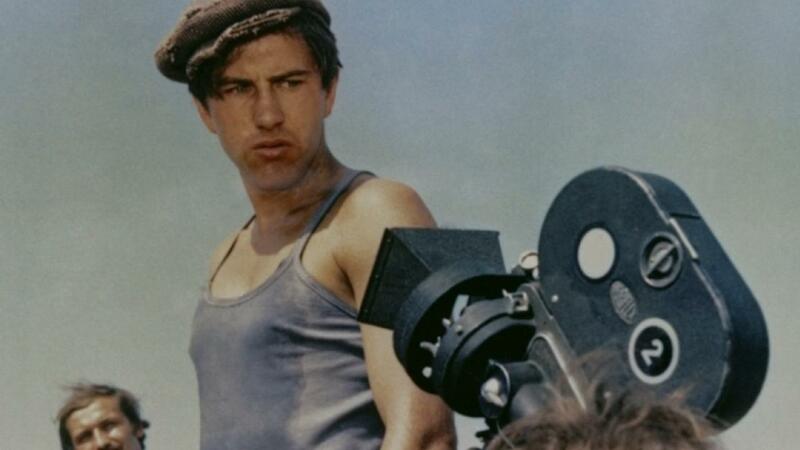 Andrzej Wajda showed a lot of guts creating a film like this are making use of the few years of censorship relaxation to bring out something so important and affecting.